One of Scotland’s most iconic paintings is being put up for sale in a move that could see it go abroad. The Monarch of the Glen by Sir Edwin Landseer is expected to generate global interest and fetch more than 10m when it goes under the hammer next month at Christie’s in London. It is the first time in 100 years the painting has been on the open market. It has been on display in Edinburgh for 17 years while on loan to the National Museum of Scotland from owners Diageo. Sir Edwin Landseer painted The Monarch of the Glen in 1851. Diageo officials said they had decided to sell the painting as it had “no direct link to our business or brands”. A Diageo spokesman said. “We have made a major contribution by loaning the work for the past 17 years, but we believe the time is right for us to pass on the ownership of the painting. The National Galleries of Scotland has not yet said if it will attempt to buy the painting. 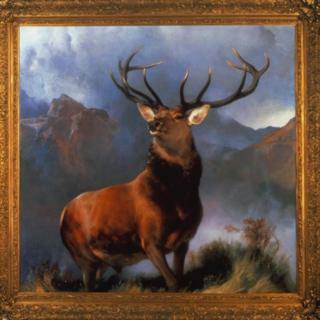 A spokeswoman said: “The Monarch of the Glen by Sir Edwin Landseer is a well-known painting which has been on public view for many years as a loan to National Museums Scotland. “The familiar image of the stag is an important Victorian picture that has taken on various layers of meaning, which include its use in advertising and as a Romantic emblem of the Highlands of Scotland. The red deer stag in the oil painting has 12 points on its antlers, which makes it a “royal stag”. The scene is thought to be set in Glen Affric. A spokeswoman for National Museums Scotland said: “We were delighted to have The Monarch of the Glen on long-term loan from Diageo and to display it in our Scottish galleries at the National Museum of Scotland. Diageo is donating another famous painting to the Scottish War Museum, where it is currently on loan. 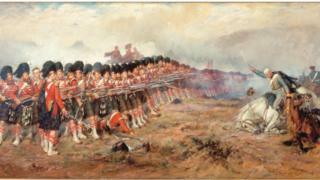 The Thin Red Line, by Robert Gibb, depicts the 93rd Highlanders halting a Russian cavalry charge at the Battle of Balaclava during the Crimean War in 1854.